I am a book worm.... I just really, really, really, love to curl up with a good book and just devour the words right off of the pages. I have always loved to read, so being given the opportunity to review books is always one of my favorite things. I was recently invited to a community of book bloggers, Blogging For Books, where I am given the opportunity to, surprise, review books! 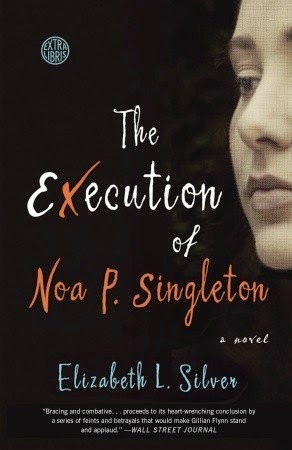 The first book that I chose was The Execution of Noa P. Singleton. This is a debut novel for author Elizabeth L. Silver. The novel revolves around Noa, who is on death row for murder. Only 6 months before "X-day" (the day she is executed), the mother of the woman that Noa murdered has had a change of heart, and wants to see her life spared in exchange for her story, as she never spoke on behalf of herself against this crime. The story is told in Noa's perspective and flashes back and forth between the past, where you learn about her negligent mother and her absent father, and her present, as she waits on death row attempting to make sense of her victim's mother coming to her defense. As a lover of all books suspense, psychological thriller, murder-mystery, etc... I was so drawn by the premise of this book. However, once I started reading, I had a difficult time staying as highly interested. The book is very wordy, and at times would distract from the story line. I still found the book to be enjoyable as I was incredibly anxious to see how it would end (and there is a twist at the end, which I always appreciate). If you are turned off by the overuse of similes and metaphors, then I would not recommend this book. If you find them helpful for painting a picture in your mind, then you may love Silver's use of them throughout the novel. I really enjoy the act of reading itself, and was not entirely bothered by this, however, it is prevalent enough that it deserves mentioning. ****I would highly suggest reading a handful of reviews on Amazon before you decide to purchase this book to get a better idea of whether this book may be the right one for you. Because this book has reviews that seriously range across the board, I think it would be best to consider your personal preferences in reading material and style before deciding to read. Disclosure: I received this book for free from Blogging for Books for this review.